The sun couldn’t be shining more brightly on Lombok. Seasoned travellers to Bali, tired of the crowds and touts in central Bali looking for an alternative island destination are discovering Lombok’s rich cultural traditions, beautiful vistas and unbeatable deals at the very best Lombok hotels. And now they can fly direct from Kuala Lumpur, Singapore, Jakarta and Perth (and bypass the chaos of Denpasar and Kuta). 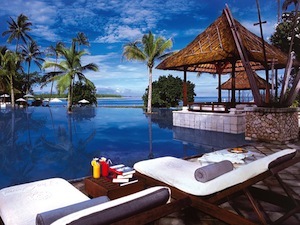 Bali and Lombok have more in common than one might first think. WHEN I FIRST ARRIVED IN LOMBOK, I stepped off the plane and onto the tarmac as the sun burned low in the sky. A faint call to prayer echoed in the ethereal evening breeze intertwined with the scent of sandalwood smoke. I though this is surreal. It felt a world away from Bali. Starting with the religious diversity of the two islands. Yet both islands are rich in tradition, open and continuously in movement with a curiosity towards the citizens of the world who come here. If you have the time, spend a few days getting acquainted with Lombok before heading out to the Gili islands. Even though you’re on the mainland, if you pick the right spot, you’ll find the same sense of isolation and calm you might be seeking on the islands. 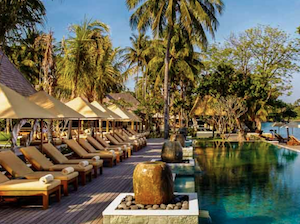 The thing we loved the most about Lombok: wonderfully low rates for five star luxury resorts. Spending the night in Lombok on your way to the Gili islands? These aren’t the newest addresses, just the best. 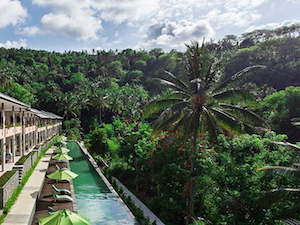 Here are the top 5 Lombok hotels, so close to the Gili islands you might be tempted to swim across the strait. Top of the list is the Oberoi Lombok for it’s dramatic view that spreads out from where you’re standing to the far horizon, over to Mount Agung and across to the Gili islands. You feel the presence of the ocean at every moment, and the reflection of the sky in the calm waters, and on the surface of the pools and shallow ponds of the property. The suites and villas are deliciously luxurious, combining modern flavours and traditional textures. The architecture references the past, present and future of Lombok. The cuisine is absolutely stunning, and the service, impeccable. With access to a private jetty and a short crossing to the Gili islands, the Oberoi Lombok makes it easy to get to the Gilis. It’s so impeccably peaceful that you might change your plans and spend another night, or two, at this phenomenal property. Oberoi Lombok, Medana beach, Tanjung, North Lombok. Tel: +62 370 6138 444 or email Imran.Sultan@oberoihotels.com for reservations. Right across the water from the Oberoi Lombok, sheltered in the same bay lies the most eccentric hotel group in Indonesia. 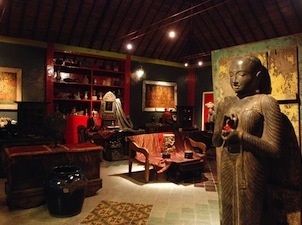 Tugu Hotel Lombok is intricately appointed with magnificent antiques from the era of the archipelago’s kings and queens. Steeped in historic legacy and cultural traditions, this hotel acts like a time portal, transporting guests to a different parallel of the region’s historic timeline. New suites were recently added to this property, so even if you’ve already had a Tugu experience, it might just be time to pay another visit on your way to the Gilis. Tugu Hotel Lombok, Jaland Pantai Sire Sire Beach, Lombok. Tel: +62 370 6120111 or email Lombok@tuguhotels.com for reservations. The Anandita is a modern, recently built, beach villa in Lombok that’s perfect for families and large groups. With acres of space and a massive pool for the kids, relaxing pavilions and attentive staff to pamper mums and an 18-hole golf course next door to keep the man of the family occupied – there won’t be a single complaint. Did we mention a stunning private beach? From the beach, it’s a short 15-minute speed boat ride to the Gilis. And if you charter a private speedboat, you have the ease of shore to shore transfers. Getting to the Gilis from Lombok doesn’t get any easier than this. The Anandita, Sira beach, Tanjung, Lombok. Tel: +63 2 889 8261 or visit the website for reservations. Qunci Villas is the leading boutique hotel in Lombok. The property consistently makes it to the top of Tripadvisor’s Traveller’s Choice list year after year. It’s probably one of the best luxury boutique resort experiences you can get for the money – not just in Lombok, but in comparison to Bali. It’s little wonder why guests keep coming back. Located in Senggigi, Teluk Nada is right next door. 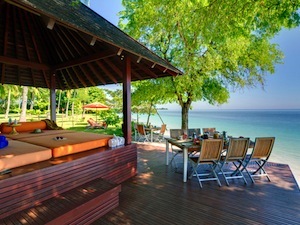 Or you can arrange for a private speedboat to pick you up right from Qunci Villas beachfront. Qunci Villas, Jalan Raya Mangsit, Senggigi, Lombok. Tel: +62 370 693800 or email stay@quncivillas.com for reservations. Also located in Senggigi near Teluk Nada and Teluk Kodek, Kebun Villas is a popular spot for couples seeking privacy, space and a modern villa in Lombok. All this and more, at a great price. The resort offers rooms as well as one, two and three bedroom villas that have their own sizeable private pools. The resort also organizes a range of activities that covers everything from learning how to dive, to climbing Mount Rinjani and cultural experiences around Lombok. After all that moving about, by the time you get to the Gilis, all you’ll want to do is relax on the beach. Kebun Vilas & Resort, Jln Raya Senggigi, Lombok. Tel: +62 370 692999 or email info@kebunresort.com for reservations.